'If you participated in Style by Jury, they would change a lot about you,' my husband suddenly declared, while spreading his sandwich with a thick layer of peanut butter. 'Perhaps my hair,' I agreed. Too late he realized his mistake, and started to retreat. 'I think I'll go to the bathroom,' he smiled a bit nervously. LOL. "Little chubby man in birkenstocks". Too funny. Thanks for stopping by the S&R weekend hop. I'm following you now. See you next weekend! Just stopped by from a blog hop. I’m following you now and hope you’ll stop by my blog sometime too! Have a lovely week. WE have to have similar conversations when my husband mentions my all day long bed head! He shaves his all off, and it is not because he is bald. He HAS hair. Nice meeting you from the hops. New follower! 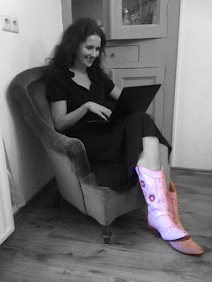 Love love love the pink boots in your garden WW post! I love your humor! Has he come out of the bathroom yet? New follower as OneLittleMom from To The Top Tuesday hop. Haha this was cute ;). New follower! LOL, this had me cracking up! Sounds like many a conversation in our house! New follower (daniellealecia) from the hop. Hi, everyone! Thanks so much for visiting Momfever and leaving a comment! I'll be sure to drop by your blogs, and follow you! Don't you love when husbands try to "constructively criticize"? Why don't they learn? I love your blog, I'm a new follower from the Lucky Wednesday Blog Hop. I'll definitely be back! If you can, check out my blog too!